I recently came across this post about shape-shifters who take animal forms, and I noticed it mentioned that Pacific Island mythology included shark-men. Considering the proliferation of sharks and werewolves in the modern media, you’d think were-sharks would be more popular, but apparently not. Maybe they just need a better publicist. And while that publicist probably isn’t me, I’m still going to tell the tale of the shark-man Nanaue. Our story begins with the shark god Ka-moho-aliʻi. While sharks are generally feared, this one was mostly beneficial to humans. He was Pele‘s brother, and a quite popular god in his own right. It appears that his only real flaw was a drinking problem, and even that could work out well for humans. The legends say that he would swim around lost ships until they gave him a drink made from roots. He’d then lead the ship back to civilization. Nice enough guy, but unfortunately the same can’t be said of his son. This son was the product of a tryst between the god and a beautiful woman named Kalei, who lived on the Big Island of Hawaii. As opposed to Zeus with his one-night stands, Ka-moho-ali’i was apparently more serious about his love for this mortal woman, and he actually married her and lived with her for a while. When their son Nanaue was born, the god realized he couldn’t keep up the charade any longer, so he returned to the sea. Before leaving, however, he warned Kalei not to let her son eat meat. Namaue was a good-looking child overall, aside from a hole in his back that resembled the mouth of a fish. Kalei hid this deformity, and did her best to keep her son away from meat. Since it was typical at the time for men and women to eat separately, however, she couldn’t watch him all the time, and eventually he ate some pork and became ravenous. After this, he turned into a shark whenever he entered the water, and frequently killed and ate the other children of the area. Upon being found out, he left for other parts of Hawaii, and kept doing the same thing until being discovered. His end came when a fisherman saw him changing off the coast of Molokai, where he was unsuccessfully attempted to overcome his addiction to human flesh. The people of Molokai burned his body, thus killing the shark-man. 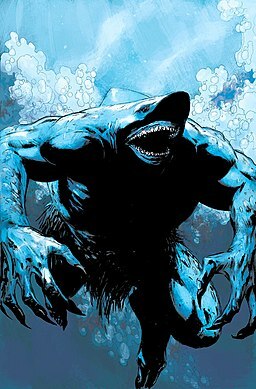 When searching for information on this were-shark, I came across this Wikipedia page, which indicates that Namaue, usually known simply as “King Shark,” appeared as a villain in DC Comics. He apparently fought Superboy and some other heroes, and eventually ended up as an unwilling helper to Aquaman. While I’ve never really gotten into comics, I often find myself impressed by how educated some comics creators obviously are. And people used to say that comics would rot your brain. This entry was posted in Animals, Comics, Mythology, Pacific and tagged dc comics, ka-moho-ali'i, kalei, king shark, nanaue, pele, shape shifters, sharks. Bookmark the permalink. In Hawaiian language this story is called ‘Ka Mo’olelo O Nana’ue’, The Legend of Nana’ue. One of so many awesome Hawaiian mythology tales.